In recent writings I have reflected on the generosity of God, the role of Christian faith in facilitating action on the most pressing issues facing the contemporary world, and especially a Christian contribution to the delivery of human rights. In Christ and Human Rights I return again to the basic issue of the understanding of God. What sort of God does human rights require? Not a God of tribal partiality, hate, discrimination, punishment etc. Such imagery in relation to God has been operative in all the major religious traditions. Against this there is a persistent tradition in Christianity and in other major religions that there is a God of love, compassion, justice and fairness, forgiveness and reconciliation. There is an urgent need to encourage all of us to re-imagine this God, and to use all the imagery and imagination at our disposal to do so. I have come to think that the imagery of hospitality may be one useful avenue towards realising this goal. Hospitality comes in many shapes and forms, and potentially this concept also has positive and negative elements. Here I want to explore the language of hospitality and to develop it constructively in relation to God, and to our response to God in the world. At the same time I want to develop further the connection between faith in God and the pursuit of human rights. Hospitality has to be conceived: it also has to be actualised, if it is to be a gift that can be unwrapped and enjoyed. God in the major world faiths is a hospitable God. There are of course contrary readings. God has been envisaged as a savage God, even a brutal, tyrannical God whose chief delight is to punish those who disobey him by causing havoc, suffering and death on a grand scale, and followers of such a God have sought to replicate these characteristics in turn in their conduct towards other human beings. But to major on this tradition would be a kind of ironic tribute to an evil God. Here I want to focus on the broad stream of reflection and action based on the recognition of a gracious and loving God, who is par excellence hospitable. I concentrate again on Christianity, with which I am most familiar. The long tradition of Christian hospitality stems from an attempt to respond to the perception of the call to service of a loving God. Beyond explicit mention of hospitality there is a rich stream of reflection on the nature of God as unconditional love, unconditional generosity and compassion, unconditional hospitality. We are accustomed to thinking of the doctrine of God in Christian doctrine as a reflection on divine being and action. The tone of this meditation, not always but significantly often, sounds a note of divine loving concern and of hospitality – even in such classic thinkers as Augustine and Aquinas, Luther and Calvin, Schleiermacher (especially in the Christmas Eve dialogue). Hospitality may not be what we think of initially in these contexts – the great theologians were by no means uniformly hospitable. But the classic Christian leitmotif is always there. We can find the same confidence in divine hospitality in poetry, e.g. in Auden and Hopkins, in music, in the Christian Mozart and Bach and the Jewish Copland and Bernstein, in Alf Houkom’s “The Rune of Hospitality”. 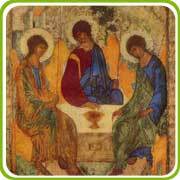 We find hospitality in art, in Leonardo and Michelangelo, in the famous Rublev icon of Trinitarian hospitality (pictured above), and in Chagall’s Mainz stained glass. God is understood differently in different world religions. To minimize the important differences is not to facilitate but to stifle constructive engagement between them. Yet they do have aims and aspirations in common, arising from their different visions of God but targeted towards the same human race, in its frailties and its potentialities. Different Gods, same human race. There are however, as we have seen, some bridge concepts which link the religions in their quest for the realisation of God’s will for humanity: one of these is the divine hospitality. It is often said that in a religious context only God has rights and humanity has only duties and responsibilities towards God. Yet for the major world religions there is a kind of reciprocity between the divine and the human. This is not any kind of assimilation but an affinity of opposites. In Islam and in Judaism the asymmetry is privileged. In Christianity the asymmetry is qualified by the paradox of incarnation. In Hinduism and Buddhism there are other visions of interaction. A Christian version of this relationship will bring to dialogue the recognition that God has given his rights as the unconditional source of love over into the human realm through Jesus Christ, as a catalyst and energising source for human compassion. Other religions will construe this contribution through their own channels. There remain for all the world religions equivalents in different ways of the visions of the compassion of Allah, the righteous love of Yahweh and the self-dispossessing love of God in Jesus Christ. I want to suggest that each of these visions can make substantive contribution to the realisation of the divine rights of God as the ground of human rights, and the notion of hospitality as central to God. But the divine rights of God are shared rights. God is a God who cares. Here is a link with a humanist as well as a religious vision. A theological humanism has links with a secular humanism, in sharing the framework of ultimate care. Its distinctive contribution is the suggestion that human caring is also a matter of grace and spontaneity, not simply of enlightened self-interest. Human grace is an aspiration to which all human beings, religious and non-religious may aspire, and may draw upon as a vehicle for the delivery of human rights at the point of greatest need. For those of us who believe in God through Jesus Christ, this human grace is the fruit of the self-dispossession to us of the divine rights of God. For all who believe in God, it is a trace of God, differently construed in different faiths, of the will of God for the created order. But however construed, the crucial point is the human rights imperative as the consequence of the reality of the hospitable God in an often inhospitable landscape. Let us think this through further. For Christian theology God acts through word and sacrament, through participation and embodiment, in the created order. God’s word is an hospitable word, both in shape and in content. The word of God, we may instantly recall, is likened in the Bible to a two-edged sword. Can we, without becoming lost in a cloud of liberal sentimentality, think of a sword of hospitality? I rather doubt it. We must in all probability abandon the sword metaphor. We may retain the underlying truth that hospitality is not always welcome. It may divide and create tensions, it may be refused, because of self-interest or misunderstanding, or because it is costly and inconvenient. We should not expect hospitality to be always achievable without careful preparation. Since the hospitable character of God is understood to be recognisable in the life of Jesus, his words and actions, in his death in solidarity with the marginal and in his resurrection through and beyond death, we may understand the Holy Spirit as the spirit of hospitality, and the divine complex which we call Trinity as a matrix of hospitality in which we are enabled to participate and empowered to offer hospitality to others. As a consequence, we may be encouraged to understand that resistance to the hospitable in the created order is not an intractable problem for all time, but a situation in the midst of which God’s vision of love, peace and justice is promised. How does the hospitable God act? God acts through people. There is a rich strand of reflection on the hospitable frame of mind in the tradition of Christian spirituality – from the early church to Leighton and Nouwen. We do not always have a hospitable frame of mind – usually due to our insecurities. If we are to move and encourage others to move from the selfish to the selfless, we need to encourage personal as well as corporate structures of hospitality. Psychology has a significant role here – perfect love casts out fear etc. We might think of human progress from the paleolithic to present as a move from more fear to less. But there is clearly no straight line of progress – as many people live in fear today as ever did. Somehow we must try to move towards unforced consensus. Augustine speaks of hospitality. For Thomas the hospitality of God is not as strange as is often thought. Luther and Calvin can speak of hospitality – Calvin sees it as a duty to migrants. God’s hospitality is expressed in personal commitment and in church engagement. But it has implications in almost all areas of human life, perhaps not least in politics, in its theory and its actualities. Though it does not explicitly reflect on hospitality, much weight is placed on dimensions of hospitable politics in Jim Wallis’s classic, God’s Politics, a moderate evangelical critique of the politics of the American Christian Right. Against this he advocates a different kind of religion. Prophetic faith is the best counterpart to fundamentalist religion. We bring faith into the public square when our moral convictions demand it. But to influence a democratic society, you must win the public debate about why the principles you advocate are better for the common good. That’s the democratic discipline religion has to be under when it brings its faith to the public square. Love is an abstract noun, something nebulous. And yet love turns out to be the only part of us that is solid, as the world turns upside down and the screen goes black. We can’t tell if it will survive us. But we can be sure it’s the last thing to go. God is a hospitable God. Anything else associated by human beings with God is simply wrong. Of course human religion has added numerous laws, rituals, purity codes, taboos, and more to its understanding of God. As far as these are consonant with the love of God they are unlikely to be harmful and remain a matter of culture and custom. But where they contradict the unconditional nature of the divine love they are undesirable and may have to be opposed. This will apply to many of the practices in the sacred texts of the major world religions. The text is important, but not a sufficient guide to the nature of the God who has revealed himself as unconditional love in human experience. Newlands, George, Christ and Human Rights: The Transformative Engagement, (Ashgate, 2006). Wallis, Jim, God’s Politics, (Lion Hudson Plc, 2006), p. 71. Amis, Martin, All That Survives Is Love, The Times, 1 June 2006. This entry was posted in Papers. Bookmark the permalink. Post a comment or leave a trackback: Trackback URL.